View More In Sand Blasters. 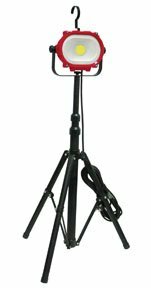 Features include: Super bright 35 Watt COB LED, Heavy-duty industrial design with die cast aluminum housing, 16 feet water-resistant power cord remains flexible in cold weather, quick fastening light head for easier adjustment, 160 degree horizontal rotation on base, rotating telescopic stand easily folds for storage and extends from 25 inch to 72 inch and long beam distance. If you have any questions about this product by ATD Tools, contact us by completing and submitting the form below. If you are looking for a specif part number, please include it with your message.